lenn Lewis (b: 1935), winner of a 2017 Governor General’s Award in Visual Arts, has worked in video, performance, film, ceramics, photography, sculpture, and writing. He was a key member of the avant-garde art scene in Vancouver during the 1960s and early 1970s. 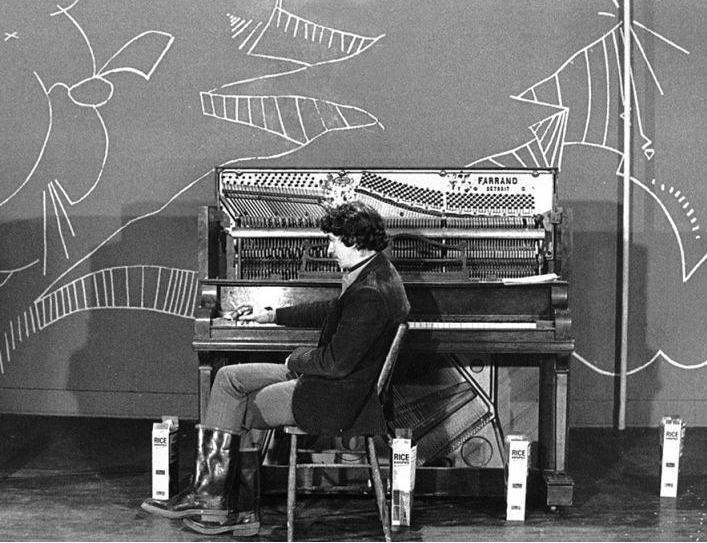 Like many artists of the era, Lewis adopted a persona, Flakey Rose Hip. 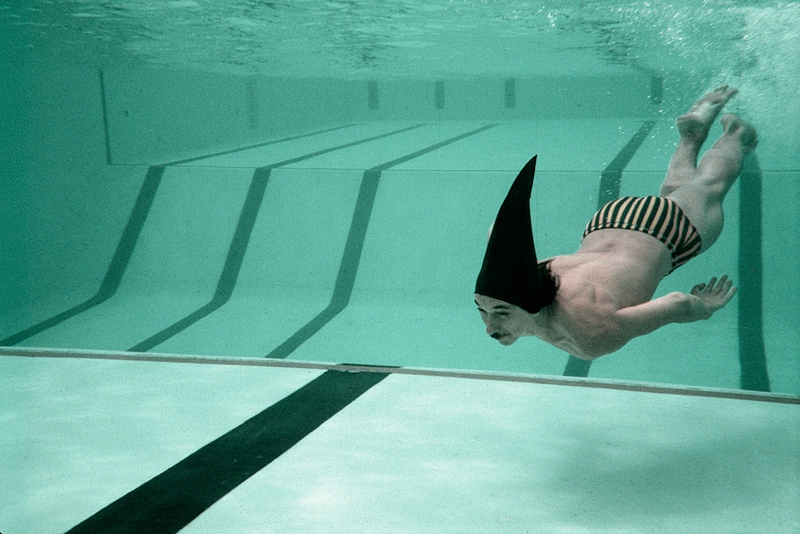 Swimming events with shark fin bathing caps at the Aquatic Center, Vancouver 1970. Thinker at Piano in Rice Krispie: As Lewis sat at a piano, thinking, an assistant emptied boxes of Rice Krispies onto the floor. Lewis got up and stomped slowly through the cereal in his gumboots, crunching with every step. 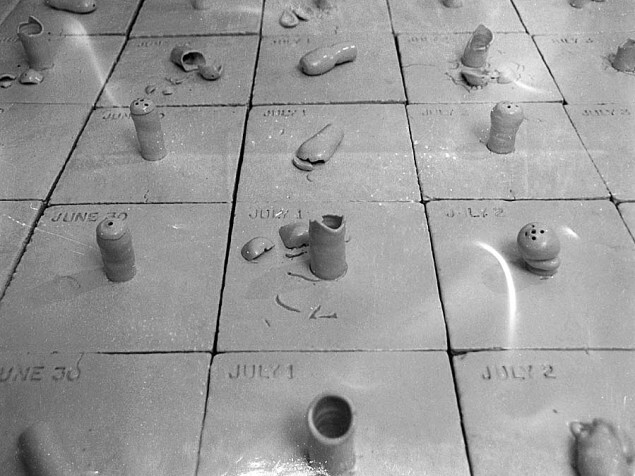 Too Profane: In March, 1970, a crate arrived in Osaka, Japan containing Lewis’s Artifact, a sculptural ceramic work made up of 176 individual tiles. The federal government had commissioned it for Canada’s pavilion at World Expo. But pavilion officials nixed the work, embarrassed by the protuberances, which they saw as pornographic phallic symbols. The work was shipped back to Ottawa and sat in a federal warehouse for 16 years until it re-emerged as a Vancouver Art Gallery exhibit. 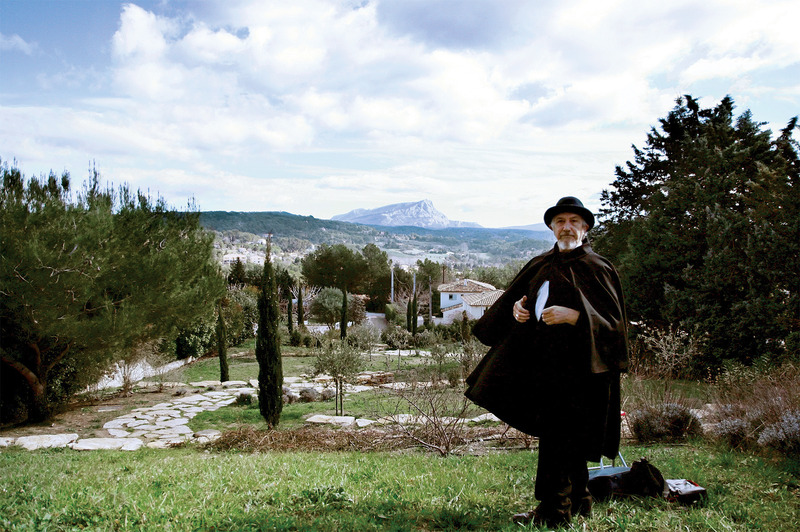 I Won’t Take Your Hand Monsieur Manet: In 2007, Lewis performed a tribute to painter Paul Cézanne by videotaping a hand-washing ritual in each of the 27 fountains of Aix-en-Provence, France. The title comes from the greeting Cézanne is said to have given Édouard Manet (I Won’t Take Your Hand, Monsieur Manet, I Have Not Washed in Eight Days). The result was a series of video loops viewable on several monitors at once. Glenn Lewis has appeared in some two hundred solo and group exhibitions. His prolific output includes sculpture, performance, environments, synchronized swimming, multimedia, correspondence art, film, photography, dinner parties and parades. He is a founding member of the Western Front, founded in 1973 and continuing today as a studio and exhibition venue for artists working outside gallery tradition. Glenn Lewis on the 2017 GG Award in Visual Arts video, here. An online timeline catalog of his early work, here. This is #22 in the series 150 Artists. The fact that the government hid “Artifact” for 16 years is a testament to Lewis’ genius. Here is a very interesting artist that I knew nothing of. Thank you! I learned after I posted this that he actually had to negotiate with the feds to get his work back, even though they never paid him for it. Good for him! The feds are no judges of art.